Emirates’ new first-class suites are some of the most beautiful in the sky. The pros: a beautiful design, cutting-edge tech and fantastic food. The cons: the crew still isn’t totally familiar with the product, and it’s not on the airline’s A380s yet. 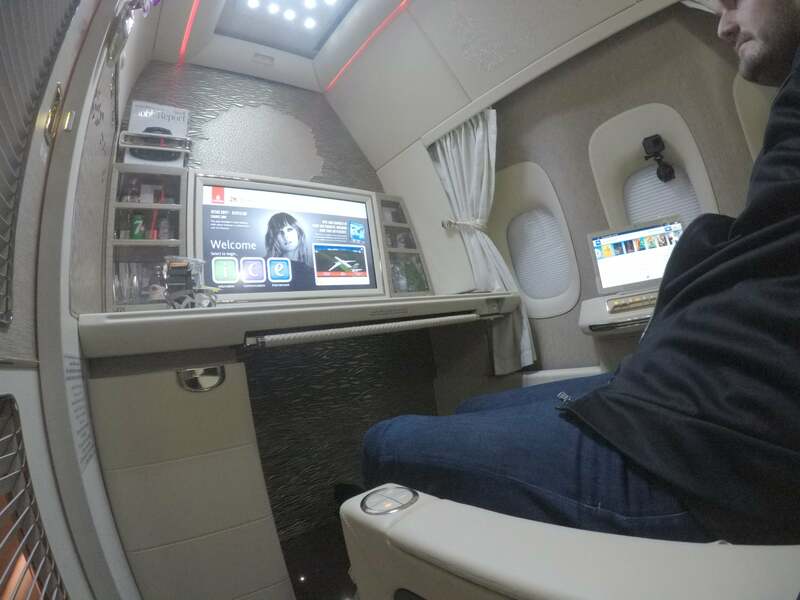 As much as it pains me to say it, I wasn’t the first on my team to fly Emirates’ new first-class product. TPG Editor-at-Large Zach Honig was the first TPG employee to fly the all-new product — and I’ve been jealous ever since! I finally got a chance to test it out from Brussels (BRU) to Dubai (DXB) in February, and made it a point to not only fly this new product on Emirates’ 777-300ER, but also Singapore’s 50-square-foot first-class suite on the Airbus A380 and Qatar’s new Qsuites business-class product on its A350-1000, all by the end of the first quarter of 2018. Although Zach has already done a complete review of the new Emirates suite, I want to share some of my thoughts about my experience. I can say with certainty that until Emirates debuted its new first class with virtual windows in the middle seats, I’ve never uttered the phrase “I was bummed I couldn’t select a middle seat.” I really wanted to see what all the fuss was about, as these virtual windows allow passengers sitting in the two center suites to have a live view out of the side of the plane. Oh well, I guess I’ll just have to keep flying this aircraft until I can snag my desired middle seat and test out that cutting-edge tech! Long story short: My flight was delayed and boarding was a mess. One thing I don’t like about Emirates it boards first class, business class and elite members all at the same time. 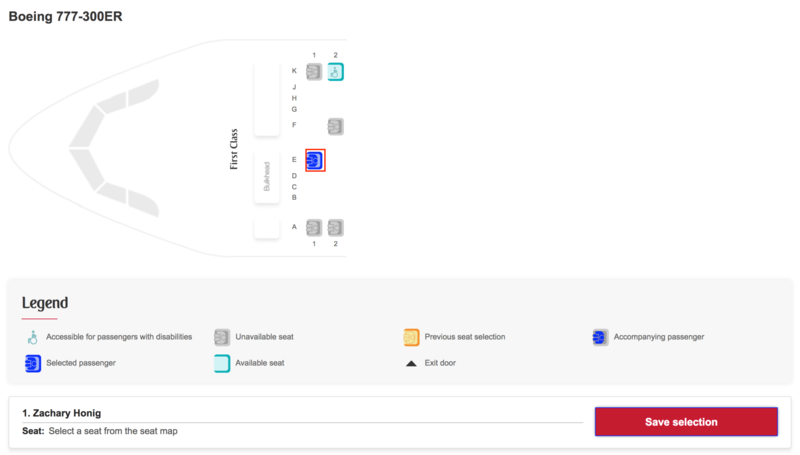 On this flight, half the plane was one or more of these categories, which resulted in what was essentially a stampede to get on the aircraft. There were also delays while boarding, so everyone was standing in line and waiting impatiently while boarding came to a halt for a bit. 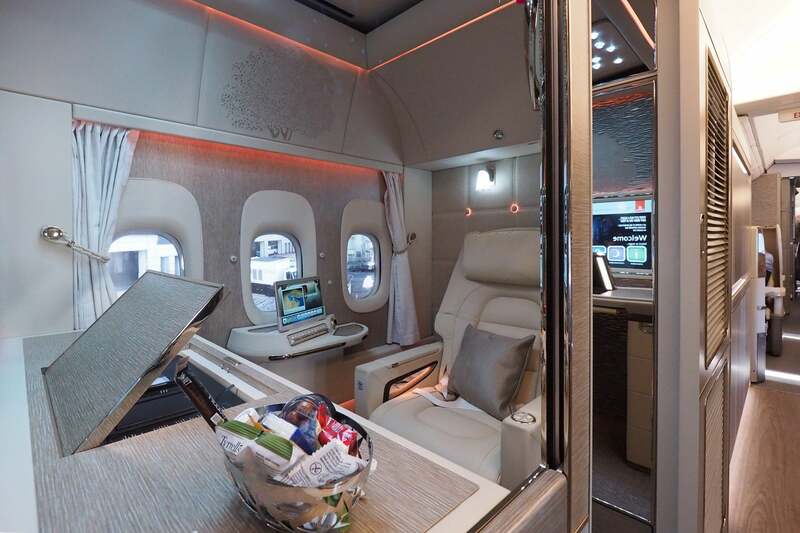 While they still have some of that trademark Emirates bling, the new suites are slightly more subdued, with more neutral tones and leather. 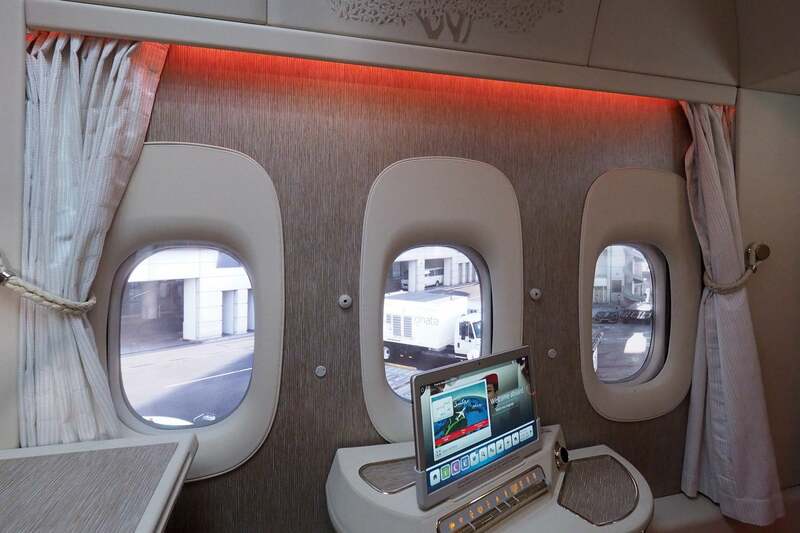 The seat itself is much more plush than the older Emirates first-class seats, with ultra comfortable leather headrests. Every little detail was considered, and to me it felt more like I was on a yacht rather than an airplane (which isn’t shocking because designers had that in mind when designing the suites). The “zero gravity” recline option was the best for watching movies. You’re in the ultimate relaxed recline position (per NASA): reclined, supported and just chilling, just like your dad in the La-Z-Boy recliner in his living room. The obvious downside? This is no Singapore A380 suite or Etihad Apartment. 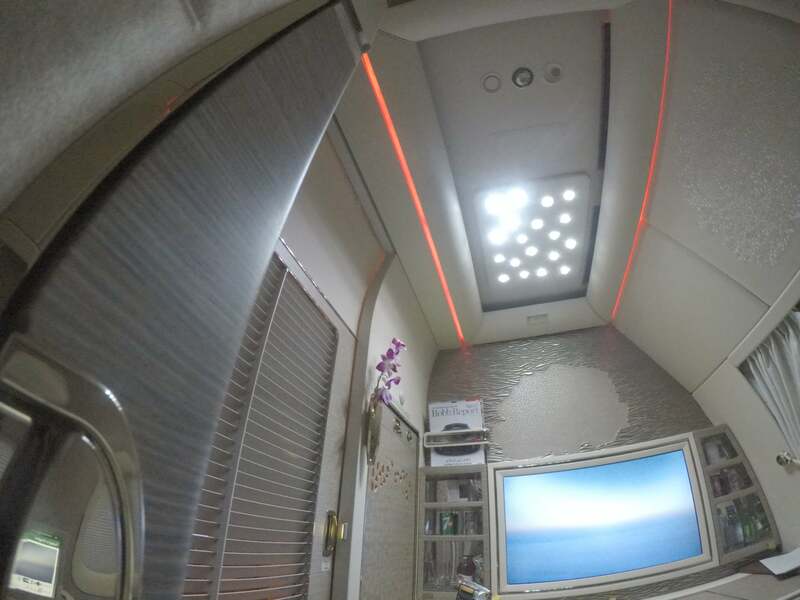 You’re still in a small box and have to slide underneath a shelf in order to sleep versus having a separate bed on both Singapore and Etihad. While there is a decent sized storage unit, be careful to not put ANYTHING on either side of the seat since it shifts to the right and left depending on the bed position. For example, I’d placed a camera on the ground and then left my suite. The flight attendant came to make the bed and when I returned I found the camera jammed against the wall, though it was undamaged, luckily. Emirates’ entertainment options are the best in the sky, in my opinion. The screen is massive at 32 inches (on par with Singapore’s 32-inch screen) and the options are endless: TV shows, movies, music and more. The storage space was ample too, which I loved. Like I mentioned before, when the seat turns into a bed, it will smash anything you’ve stored to the right, so it’s best to store your belongings to the left. It’s probably best not to leave any electronics at all on the floor beside your seat in case they get crunched when you recline. Inside the storage locker, there were several small nooks to stash belongings. I actually put my wallet in this enclosed closet-like space and then couldn’t find it! It was just hidden on a shelf in the closet, but it goes to show how vast the storage space is. Call me spoiled, but I love the A380 — it’s quiet and spacious with lots of lounge space and huge bathrooms. In my opinion the 777 is a loud beast with very little space. The bathrooms on this aircraft were pretty disappointing too — at 6’7″, I simply didn’t fit, which isn’t uncommon, but the A380 bathrooms are simply amazing — especially with that shower! I couldn’t even manage to stand up straight — resulting in an automatic fail for the TPG bathroom test. It seems like Emirates didn’t make the bathrooms a priority when designing these new suites. Even though the doors are floor to ceiling, I still thought the suites would be more private. Granted, no one can see in, but I could see out through the slats. They were weirdly curved in some sections, which was frankly odd and made them seem like broken blinds. Sometimes with brand-new products, there will be flaws, and this was no exception. For example, I noticed my neighbor’s window blinds were stuck, and when landing, I noticed that he had a table cloth over the windows to act as a shade! 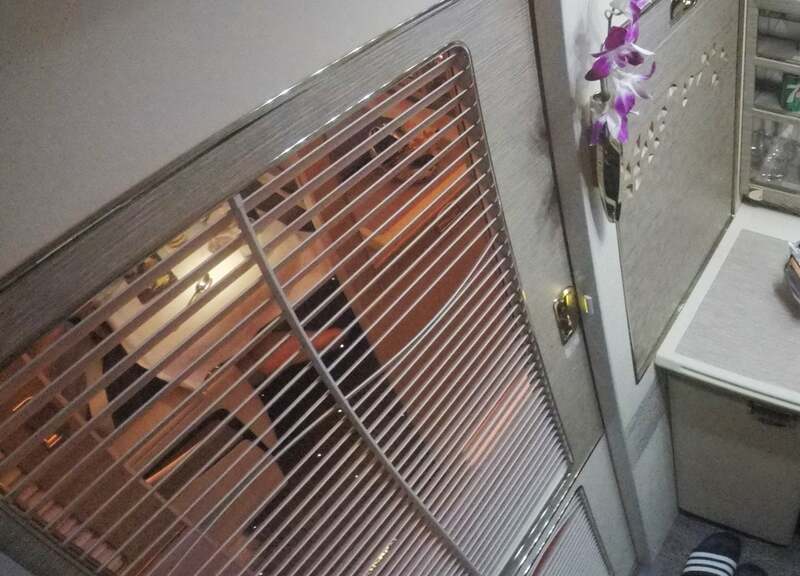 At first, I thought maybe he was changing or something, but then I realized that two people were trying to pull the window blinds — but they simply wouldn’t budge. 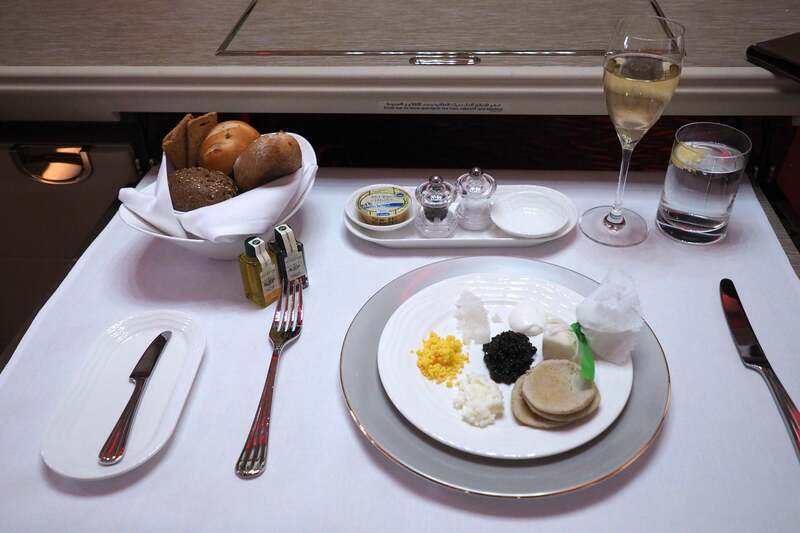 You’ll always dine like a king in Emirates first class, no matter which aircraft you’re on. As usual, I munched on caviar and sipped Dom Perignon Champagne while perusing the impressive wine list. There were several appetizing choices for the main course, which made it hard to pick. 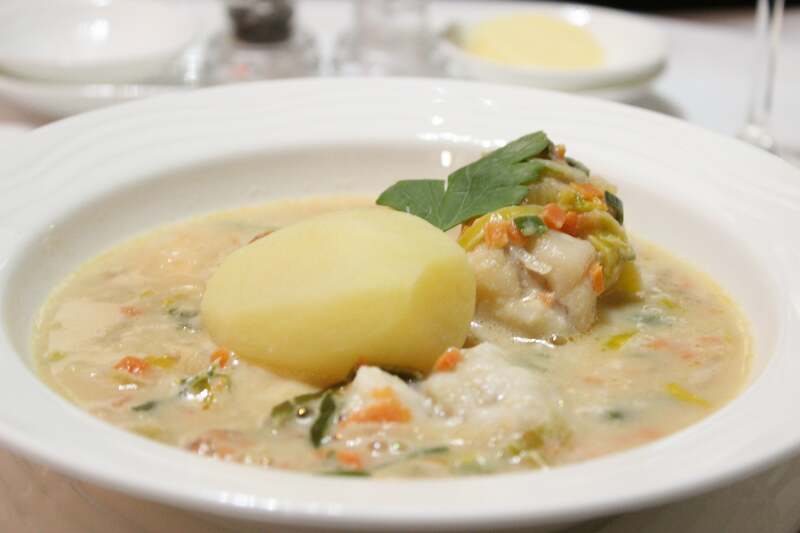 Maybe because its name was so fun, I chose the seafood stew “Waterzooi.” It was good, though not really that memorable. But, thankfully, I can always count on Emirates caviar! While I found the flight attendants to be friendly and welcoming, it’s clear they are still getting to know the new product and maybe could have used more training on it. For example, the new video calling features in the suites is a super cool concept, but when I tried to operate it, the FAs didn’t video conference me back. Granted, this could’ve been an issue with the tech itself. Regardless, these suites come with a ton of new tech, and it’s important that the crew is fully trained on how to use it. I also found there to be way too many buttons. I never really figured out how to use them all, and the crew wasn’t especially helpful in telling me. Another sign that I’ll have to fly this product again, you know, to train myself! 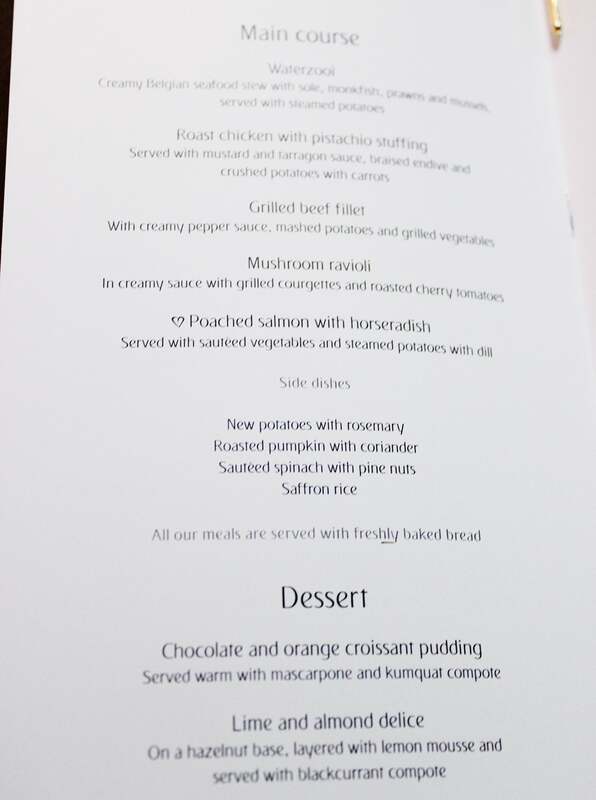 With so much hype surrounding all these new first-class products, it’s hard to pick a favorite, but in general I feel more excited about Singapore than Emirates. 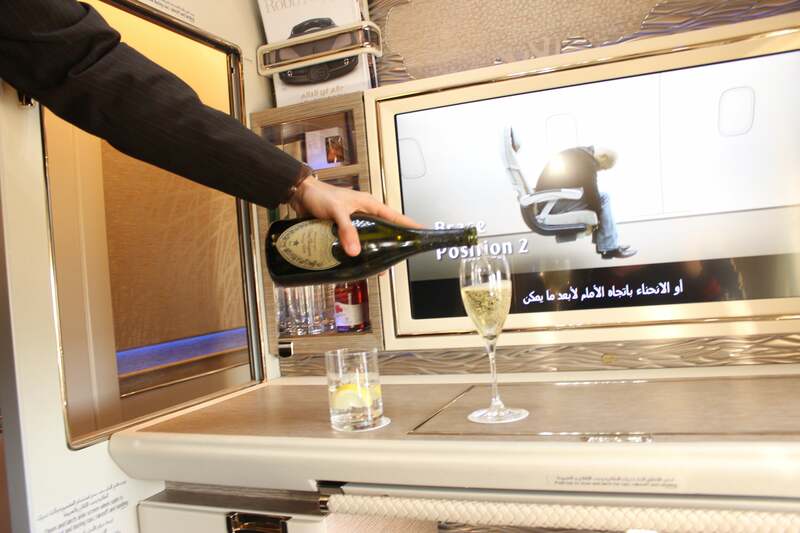 If you’re flying with someone else, the new Emirates suites aren’t ideal; It’s better to fly them when traveling solo. However, if you are traveling with someone, your best bet is to sit in row one on the left side or row 2 on the right side so you can be closer to your companion. After the 777, I flew the airline’s A380 in first from DXB to Sydney (SYD), and even though the suites are much smaller, I like the A380 experience so much better — especially leaving from Dubai where you board directly from the lounge. I was traveling with my two best friends, so the A380’s onboard bar makes the flight a much more social experience. Of course showering before arrival is key, too. After landing in Sydney at 10:00pm we went directly to a bar to meet friends — fully rested and showered! The 777 suites are surely beautiful, but not as spacious as the Etihad Apartment or Singapore’s new Suites. Plus, the 777 lacks the quiet and amenities of the A380. While I like what Emirates did with the product, it’s not the best first class product in the world — at least in my humble opinion. That goes to Singapore’s new A380 Suites.